“My cat needs one.” “I have some balloons that need popping.” “Look! It’s green!” – these are all perfectly legitimate reasons for buying a laser pointer. But what to do when you’re bored of pointing at things? Never fear: I have answers. Here are 6 things do with a laser pointer once you’re all pointed out. 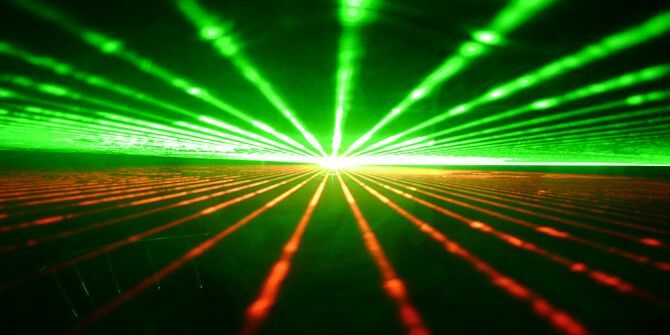 Laser pointers are generally less than 5 mW, but a laser of any power can cause damage to optic nerves if viewed directly for a prolonged period of time. Catching a brief glimpse of the beam is not dangerous at these powers. In practical terms, this means that you should not direct beams at anyone’s eyes. If you’re setting up laser tripwires for instance, these should be laid low to the ground to avoid the gaze of curious children. Higher powered scanning effects should be aimed just above head level so that beam’s effects can still be experienced without danger. Also, know that pointing a laser at a plane or helicopter is an offense, but probably not applicable at times of revolution. I don’t like to toot my own horn too much, but this project of mine was published a few weeks ago and is definitely up there on a higher level of awesome. On that occasion, I used a specific laser module, but you should be able to extract one from a laser pointer and power it directly from your Arduino. Using two servos, one on top of the other, the laser turret sweeps around, firing at millions of invisible X-wings. Alternatively, adjust the code to be a little more relaxed and provide literally minutes of entertainment for your fluff ball of choice, as this cat is aptly demonstrating. The simplest laser microscope involves shining the laser beam directly through a water droplet – you can suspend the sample on the end of a skewer. A more advanced project with much sharper images can be made with a smartphone, which you can of course then capture photos with. This project doesn’t even use the laser diode: just the lens used to focus the beam. Align a laser module with a photo-resistor and you have an invisible tripwire. The photo-resistor should read a constant high as the laser beam hits it; until the beam is broken by an intruder and booby traps are activated. The only difficulty is aligning the laser and tiny photo-resistor; you’ll need to fix them securely so they don’t misalign later. Your laser tripwire can then be used as a trigger for high speed photography How To Use An Arduino To Shoot Beautiful High-Speed Photography How To Use An Arduino To Shoot Beautiful High-Speed Photography Read More , such as a water droplet falling. This is a particularly clever Arduino setup which is self-calibrating. I made a similar project a while back, but using a sonar distance sensor How To Make a Simple Arduino Alarm System How To Make a Simple Arduino Alarm System Detect movement, then scare the heck out of an intruder with a high pitched alarm sounds and flashing lights. Does that sound fun? Of course it does. That's the goal of today's Arduino project, suitable... Read More instead of a laser tripwire – you can probably adapt that code quite easily. The dog was not amused. Using the long exposure mode on your camera, you can make some really interesting photographs. Just turn the lights out, release the shutter, and start waving your laser pointer around. If you paint a wall with glow-in-the-dark effect paint, you’ll also find a laser pointer will excite the paint sufficiently to keep it lit for some time – so you can effectively “paint” without the long exposure of a camera. You may need a strong blue, violet or UV laser for this to be really effective though – red and green don’t work so well. In this case, the technique has been been combined with an Arduino that reads tweets! Combine a laser tripwire with multiple trip points, multiple lasers, lots of mirrors, and you’ll have one of the coolest Halloween haunted houses in the neighbourhood. A smoke machine is essential, as is keeping all those mirrors in alignment. In July this year, crowds crammed into Tahrir Square in Cairo to celebrate the overthrow of the religionist extremist President Morsi. As well as fireworks, they used green laser pointers to show their support for the military – despite the obvious dangers of blinding the pilot. So I guess it’s officially a thing now: the next time a protest happens, you can officially show your support or frustration by shining a green laser at things. What would you do with an old laser pointer? Tell us in the comments.